The Waxwings are on their way back to Finland and Russia. This is giving me a second chance to sketch them. I had many sightings as they moved west before Christmas. But now they are on their return journey. 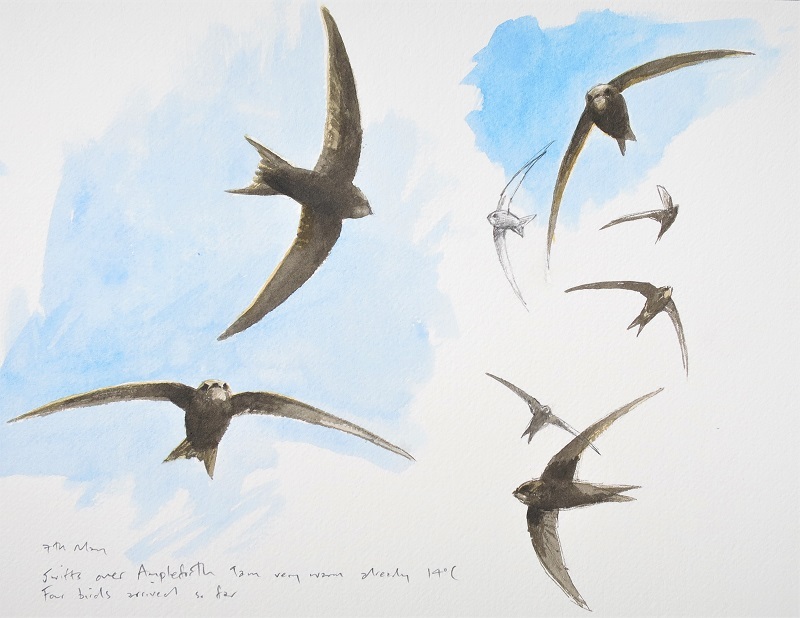 They have been seen around Ampleforth College orchards over the last week or so. Strangely this orange rowan still has a heavy crop of berries. Waxwings are truly beautiful. Some winters there are just a few in the country, but this has been a Waxwing winter and they have filtered West across Britain in their hundreds. They gorge themselves on berries in smash and grab raids, filling a pouch beside their throats, then retiring to digest them in a nearby tree. The current Ampleforth flock will be eating any berries they can find and in warm weather catching insects on the wing which they do with grace and agility, ahead of their North Sea crossing. 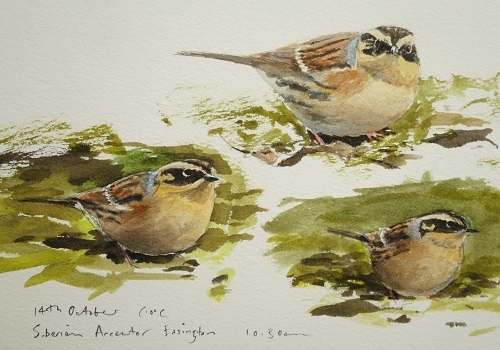 I rarely travel far to see birds, but having spent a lot of time observing bird migration on the East coast of Yorkshire this October, the appearance of the first Siberian Accentor on the British Mainland seemed to me to be the culmination of what has been one of the most exciting autumns I can remember. Thus on Friday morning I found myself amongst hundreds of birders at Easington near Spurn Point. The bird approached to about ten feet at times, though I found myself climbing a tree to see over other birders. This gave me the space and time I needed to sketch. Whilst the pencil sketching was done at height the watercolour work was finished at ground level. A really beautiful subject. It is always nice to find something different. Yesterday whilst sketching the seascape at Sandsend a small tern flew in from the sea from the East. Fortunately it settled on the beach near the beck outflow. It rested for several minutes before being disturbed by a dog, but I was able to sketch the bird suspecting it to be a White- winged Black Tern as opposed to the more common Black Tern. It stood for a while by some Sandwich Terns giving a good size comparison, before flying back out to sea. A very memorable sighting and amongst the rarest birds I have found. These were my initial sketches made during and just after see seeing the bird.